Blog Why Use a Wok With A Flat Bottom? I live in a neighborhood where families on either side of me use a grill or a wok on the weekends. In fact, there are three families on my short block that all use woks. Some of them used a wok burner and others just put their flat-bottomed wok on the open grill. It seems that most of the woks on the grill are of the flat wok design rather than round-bottomed. I did not know the cooking difference between the flat-bottomed wok vs the round-bottomed wok. So, this started my “rabbit hole” investigation on why people use a flat-bottomed wok. Here are my findings and I hope you find them useful. Flat-bottomed woks are more stable on a flat surface like an electric stove top as compared to a round-bottomed wok. Flat-Bottomed woks are best to use with induction cookers or stoves. Flat-bottomed woks distribute heat to the bottom of the pan more evenly than round-bottomed woks if used on a flat cooking surface. If you plan on using your wok on a flat surface like an electric glass, porcelain, or induction cooking surface, it would be best to use a flat-bottomed wok. The flat portion of the wok should make full contact with the cooking surface. A round-bottomed wok will make one small connection with the stove top, and this will not be enough to use your wok effectively. It will never get hot enough. Flat-bottomed woks are a perfect match for induction stoves or cookers. Just make sure that the cooking surface of the induction stove covers the entire bottom of the wok. Make sure that the induction stove that you will be using is capable of getting hot. If you are going to use a flat-bottomed wok on a glass-topped stove, you will find the heat distribution will be a little more uniform as compared to using a round-bottomed wok on the same surface. Using flat surfaces on a flat surface is always better than a round surface on a flat surface. The size of the wok. Does the wok have helper handles? Does the wok have wooden or metal helper handles? The type of surface you will use your wok on such as an electric stove, gas stove, open fire, or other types of heating sources. Is the wok made of carbon steel, stainless steel, cast iron, or a non-stick surface? The standard size of a wok that most people use is 14 inches in diameters. If you are preparing for 8 or more people, you might consider getting a wok larger than 14 inches. If you are going to cook a large cut-up chicken plus vegetables, a wok larger than 14 inches might be needed. If you only have a small burner under your wok, you do not want a wok with a large flat bottom. Usually, it is desired to have the flat surface of the wok slightly smaller or the same size as the burner beneath it; this will provide more evenly distributed heat. Does Your Wok Have a Helper Handle? Whether your wok has helper handles is not a critical factor in determining your decision to purchase a flat-bottomed or round-bottomed wok. Helper handles are a handy addition in any wok. One large handle is standard, whether it be metal or wood, is found on most woks. Does Your Wok Have a Metal or a Wooden Helper Handle? If you have limited space to store your wok, as I have, then you might consider the smaller metal helper handles. They take less space to store. On the other hand, wooden handles don’t get as hot as the wooden handles, and you usually do not have to use those oven mitts to manipulate your wok. If you can get bamboo handles instead of wood, they are better because they do not get as warm as the wooden ones. A flat-bottomed wok will work on most cooking surfaces. They can work well on induction stoves, electric glass stoves, gas stoves, rocket stoves, and even outdoor grills. Flat-bottomed woks don’t wobble around on flat surfaces like round-bottomed woks. What is Your Wok Made of? Carbon steel or cast iron woks, in my opinion, are the best woks to use. They both hold the heat well, and both can be non-stick, depending on how well you season them. Stainless steel woks have a sticking problem, and they are costly. 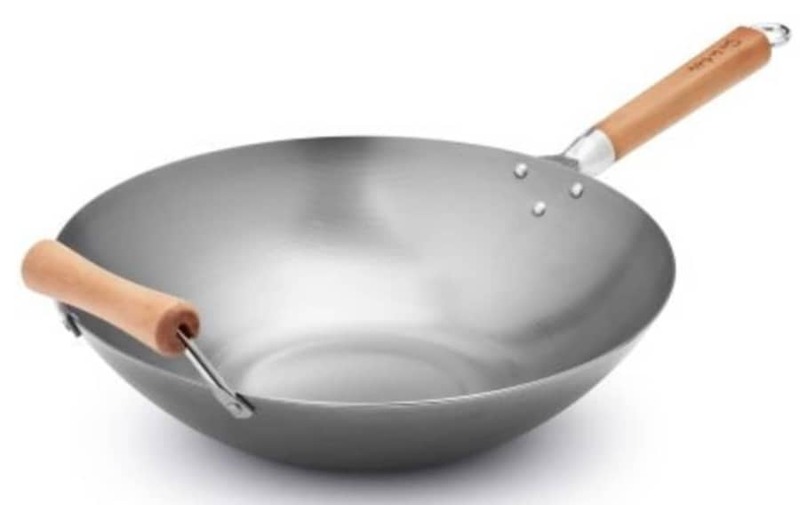 Coated or non-stick woks have potential toxic potentials. They also will not usually last as long as cast iron or carbon steel woks. If you are considering a flat-bottomed cast-iron wok, I recommend the pre-seasoned cast-iron wok by Lodge. These woks are very heavy. The weight is about 11.6 pounds, and they work well on all kinds of cooking surfaces such as gas stoves, electric coil stoves, porcelain or electric glass-topped stoves, etc. These woks hold their heat well and are reasonably priced. These cast iron woks have a flat bottom that contacts the cooking surface, but the inside of the wok is round. This inside round portion of the wok is an excellent attribute for stir-frying. Check the availability at Amazon. You do not want to drop them on your foot, or stove top…they will break both. Do not drop them on the floor. Cast iron can break if you drop it. You might consider going to the gym to exercise your biceps because they are heavy (11.6 pounds). The helper handles get very hot, so make sure you wear oven mitts to keep from frying your fingers and hands. Carbon steel woks, on the other hand, do not break if you drop them and they are not as heavy. Carbon steel cookware is not as brittle because of the percentage of carbon and iron. Carbon steel contains only about 1-2% carbon which makes them less brittle than cast iron, which has a higher percentage of carbon to iron. Most woks sold in western countries have flat bottoms—this makes them cook differently than round-bottomed woks. Flat-bottomed woks more similar to a deep frying pan because of the shape of the wok bottom. Flat bottom woks work with all types of stoves, gas, electric coil, electric glass-ceramic (porcelain) and even rocket stoves. The flat bottom allows contact with the stoves heating elements or flame. With a flat-bottomed wok, it is a little more challenging to use a traditional wok spatula or ladle to toss or pick up food. This inability to wholly manipulated food with a spatula or ladle is because the spatula is round at the leading edge. This rounded leading edge conforms to the round bottom of the round-bottomed wok but does not follow or fit the flat-bottomed wok. The flat-bottomed wok does not get as hot as the round-bottomed wok because of the shape of the wok. This could affect your stir-frying abilities. If the food in the bottom of your wok, in a flat-bottomed wok, is allowed to sit for any length of time without high heat and constant stirring, the food could be stewed instead of being stir-fried. I like the carbon steel Helen Chen flat-bottomed wok to the right because it has two wooden assist handles and a relatively smaller flat bottom. Check it out at Amazon. The carbon steel in most of the flat-bottomed woks is stamped and not hand-hammered. I say most because there are a few hand-hammered flat-bottomed woks as shown in the picture below that are available from Amazon. Notice how large the flat portion of the wok is. What I do not like about this wok is the size of the flat bottom. 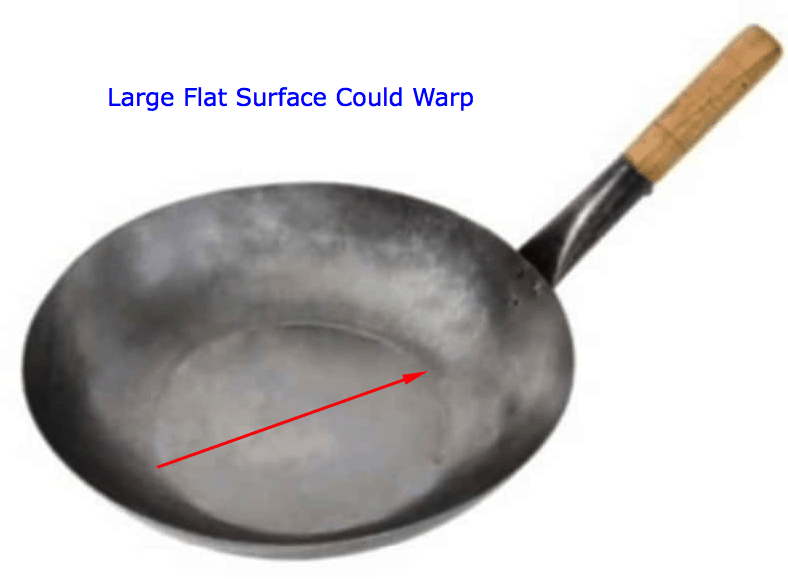 There is a high probability of the flat portion of this pan will warp when applying high heat. Once the bottom distorts it will not lay flat on your induction stove or electric stove, and you will get uneven cooking. Besides, it will most likely wobble. Therefore it would not be my first choice in flat-bottomed hand-hammered woks. If you like this particular wok, make sure you bring up your heat slowly to prevent warping, but realize that it might still warp depending on how thick the metal is. The thicker the wok metal, the less likely it will warp. I understand, from my research, that this wok has a wall thickness of only 1.6mm thick, which is pretty thin for a carbon steel wok. The only thing I like about this wok is that it has a wooden handle can be removed during the seasoning process. Other than that, I cannot recommend this wok as being the best selection for your cooking needs. There are better selections rather than this Hand-Hammered Flat-Bottomed Wok. 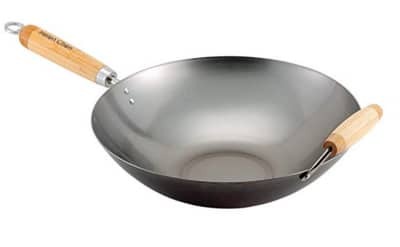 I highly recommend a wok such as the Helen Chen flat-bottomed wok. Check out the availability at Amazon. Why Use a Round-Bottomed Wok? Round-bottomed woks are the traditional woks and are best used with wok burners. What Kind of Wok is Best For an Electric Stove? Flat-bottomed woks are best used on gas stoves, induction stoves, and electric stoves.